Barbara: I'm trying to fit in a lot this weekend to make sure we touch everything. Normally I would spend half an hour talking with you about what you understand about your intentions. I'm going to trust that these circles went well, that you shared heart to heart what needed to be shared, and that it helped each of you to clarify your intentions. After this first weekend, we'll slow down and go in more depth. But I really want to make sure all of these, what Aaron calls foundation stones, are in place for everybody, that we've touched on everything that needs to be touched on, and to trust. Another form of dana, of giving, not just to me but to the whole group, is to go home and do the exercises, do your meditation practice. Because this is what will carry the whole group through to a higher level, if everybody takes this seriously and really does the inner work. So we're moving on now. My schedule says “Distinction between mundane and supramundane consciousness, and familiarity with stages of consciousness.” I'm going to let Aaron come in and talk about this. Barbara spoke earlier about consciousness and its objects, noting that mundane consciousness takes a mundane object; supramundane consciousness takes a supramundane object. Some of you, perhaps the beginners with vipassana, may have been out of the room, but it's okay, we'll come back to it. I'm going to move on and talk more deeply about the states and stages of consciousness because understanding of this is a vital part of our foundation. Many of you have read Barbara's book Cosmic Healing.. Somewhere in the middle of that book, the chapter on consciousness has a chart, States and Stages of Consciousness, page 261. There are about 8 or 10 of the books in the back of the room. Could we pass them out so every 2 or 3 people could look on this chart? Please handle them carefully, because these are books for sale... (passing out books) It's also in the handout, in the packet. Aaron: States and stages of consciousness are different. The stages fall within the state. For now we're going to look at the stages of consciousness. Note that each relates to a usual chakra, a usual tone and color. We also have a column called Body. So, state of consciousness: gross, subtle, causal, and beyond the causal. When people ask me where I am, I am beyond the causal plane. The bodies. Gross is the etheric and low astral body, subtle the astral and high astral, causal is the causal, and beyond the causal. I'll explain these terms more. Stage of consciousness. We have the magical and mythical. I'll briefly lump them together. These are not my categories but are defined by some of your psychologists and other people. Magical and mythical consciousness, the consciousness we find in young children who believe, maybe if they're angry and then somebody gets hurt, they think, “I did that.” They want the power, and they're afraid of the power. Within magical and mythical consciousness there's usually belief in precise ceremonies and rituals that will bring forth certain results. There's often a strong belief in the rightness of “my” religion, “my” politics. So there's a lot of contention. “I'm right.” “No, I'm right.” “No, I'm right.” And not the ability to understand that there can be two sides to an issue. Gradually, much of your Earth has emerged from magical and mythical consciousness into rational consciousness. Still in the gross state of consciousness. With rational consciousness, I think of your philosopher Descartes. Very rational, very precise. I am not criticizing Descartes, who was a brilliant analyst and mathematician, but noting that he focused only on the rational. Some of your traditional science that says I can't be real because you can't see me. The precision of trusting only the mundane senses. Rational. Gradually your highest level thinkers begin to think outside the box, outside rational consciousness. Logical, still, but vision logic, seeing the bigger picture. Here we get people, I would not put Einstein in the vision logic category; he's really far at the end of vision logic. But those people who have created so much in your worldthe mathematicians, the philosophers, the artists. These are people creating beyond the rational. Most of your Earth, though, is locked into rational consciousness. As we move through this low astral body and up into the subtle stage of consciousness and astral body, we come to the end of vision logic consciousness and into psychic and subtle consciousness. I'm not going to explain all the details of the chart. It might help you to read the chapter on consciousness. I want to go through this quickly to emphasize certain, most important parts as relate to our work here. Beings will move through the whole subtle state of consciousness into the causal state, Christ and Buddha consciousness, where people are really resting in pure awareness, not thinking from a space of a separate self, but knowing their interconnection with all that is. And finally beyond the causal into non-dual awareness. Barbara: comment while reviewing transcript: Jim Marion's book, “The Death of the Mythic God: The Rise of Evolutionary Spirituality” is an excellent resource to these stages of consciousness. A lower level of consciousness, a lower stage of consciousness, is not bad. We don't think the child is bad because they're not yet into a higher consciousness. We don't expect it from the three year old. I am not speaking negatively of people in different cultures and of different ideology, only stating that many of them have not yet matured into a higher consciousness. And yet you speak to them politically, socially, as if they were in the same stage of consciousness as you are, and they simply cannot hear you. As I said, you don't tell the child, “We'll have the cookies later. Now let's make dinner.” and expect immediate compliance. The child just doesn't see it your way. The child calls in the middle of the night, “Mommy! Daddy! There's a monster under my bed!” You don't tell the child, “There's no such thing as monsters. Go back to sleep.” in an angry tone, because the child is certain there's a monster. You also don't get out a gun to shoot the monster. That just supports the child's feeling that there is a monster. “See? Daddy came in with a gun!” But you do walk into the room and acknowledge the child's feelings. “I hear that you are afraid. There is no monster under the bed. Come and look with me with a flashlight.” “Well, he ran into the closet!” “No monster in the closet, either. But I'll stay here with you, because I hear you are afraid. I'll be here with you, and comfort you. You can trust my love. Nothing will hurt you.” You don't say there is no monster and get into a battle of there is/is not. “Trust me. I am here with you. I will make sure nothing can hurt you.” So you speak to the child where he is. Why then are we speaking to people in the different social situations, for example, situations of great hatred, fear, bigotry, over politics, religious beliefs, skin color, sexuality, why are we speaking to them as if they could really understand us? How can we speak to them without speaking down to them? Is there a way to be honoring and respectful of them, but in such a way as to enable them to hear us, and for us to hear them. Many of you become locked in your own views and caught in your own, let me put it this way, the places where you are still stuck in “I'm right, you're wrong.”, instead of understanding there is no wrong or right here, there are only different feelings based on different karma, different insights, different levels of present maturity. Just as the 80 year old is no better than the 2 year old, but more mature, we're not saying it's better to have a higher level of consciousness, only that to hold the bigger picture one must move into this higher stage of consciousness. One more thing about consciousness is that this is not like floors, get off the elevator at this floor and then on that floor, and you never return to a lower floor. It's simultaneous. If it were a dark night and all the lights suddenly went out, the room was in total blackness, and suddenly you heard very eerie (high eerie sound) “eeeeieeieeeieee...” kind of noises, how many of you might find some fear arising? Magical/mythical consciousness! The wiser part of you can say, “This is nothing. It's just some sound effects.” or whatever it may be. But part of you that's still in that stage of consciousness says, “Oh, some demon is out to get me, some monster!” You have to recognize the simultaneity of different stages of consciousness in yourself, and be respectful of those stages when they arise, but not submissive to them. This is how you learn to be respectful but not submissive to them in others. So you get into an argument with your neighbor. You always walk your dog in the woods behind your house. You never walk your dog on the sidewalk. But your neighbor comes over, pounding on your door, saying, “Your dog defecated all over my front yard. He does this every day. What are you going to do about it?” He's very angry and belligerent. You know there's no possibility this was your dog. Are you going to get into a “did so/did not” argument? Are you going to start hitting each other? Is he going to get out a gun, finally, and shoot your dog, or shoot you? Are you going to start screaming at his children when they chase their ball into your yard? Lower stage of consciousness, very rooted in self and fear, again. Can see that this is a way in which you can foster communication and help the other person move beyond his fixation on his lower stage of consciousness, and move into the possibility of, “Ah, maybe it was a dog that lives on the other side of me. I have seen him in my yard. I've met his owner. They let him loose.” Vision logic consciousness. Suddenly he's thinking outside the box and seeing a new answer to his concern. Now, maybe he's just going to go yell at that person; who knows? But maybe with the spaciousness, he's open to the possibility of perhaps putting a small fence around that part of his yard, or going and talking politely to the other neighbor; working out ways to live in harmony. Because you heard him, opened your heart to him, you helped him see the possibility to hear another and open his heart to another, not to be stuck where he is. Each teach one, passing it on. Each time you refuse to get caught in an angry confrontation, but truly open your heart to another person, you create infinite new possibilities. Barbara tells a story, and it's really her story but I will tell it, of picketing at a nuclear submarine base, this perhaps back in 1961, 1962. A man who worked at the submarine base was angry and belligerent, probably drunk, and came and pushed her on the ground, yelling obscenities at her. He was kicking at her with his foot, but she saw he did not intend to break ribs. He was just trying to humiliate her. She was of course sworn to non-violence, but at that age, perhaps not even 20 yet, she didn't really understand what non-violence meant. Just, “I won't hit back. I won't hit back!” There was a lot of anger. Finally people pulled him off. He called back to her, “I'll see you next week, if you're not too scared.” They were picketing at this submarine plant. It was not a nuclear submarine base; it was a place that built nuclear submarines. I apologize for the incorrect information. A boat company that built nuclear submarines. She was terrified but she felt she had to come back. Week after week they went through this dance together. About 20 minutes after the picketing had started, this same man would approach her. Why he chose her, I don't know. There were other young men and women there, and older people. She could hear, then. This was before she lost her hearing. He would push her on the ground, scream obscenities at her, kick her, and she just continued to lie there, the first weeks feeling so much anger at him. And then as weeks went by, she suddenly realized, “Maybe I'm not so bad. This has been going on for 6 or 7 weeks now and I have not hit back. I have not yelled back.” She saw in herself how afraid she was, and suddenly it clicked. “He's also afraid! He's afraid of losing his job building these submarines. He's afraid of what might happen to our country with his view of where we would be without nuclear submarines. He's afraid of my power. He's afraid of a lot of things.” And her whole attitude softened with compassion for both of them. You give off a different energy when you're angry and contracted than when you're soft and compassionate, even with face hidden in the arms. The kicking stopped, and she knew they had not yet pulled him off. She looked up. Their eyes met. He said to her, “Why do you keep coming back?” She said, “Probably for the same reason you keep coming back. We each believe we're right, but we can't hear each other.” He reached his hand down to her. At first she thought it was a trick, but she took his hand and he helped her to her feet. She said-- he saidI'm not sure who said it first, “Let's go talk.” And some of the others who were picketing and some of his companions all went down the street to a pizza parlor. They sat down. They had pizza, coffee, whatever. They talked and they talked. The picketing continued week after week, but also an ever-larger group met at the pizza parlor to talk, each one explaining their view, with the only ground rule being no interrupting. No saying, “No, I'm right, you're wrong,” but listening to each other. This is the shift into vision logic consciousness, and beyond that, really the opening into higher consciousness. It happens in simple situations like these with your neighbor with the dog poop, with the people angry at your political beliefs, at your racial beliefs, at your sexual preferences, or what you think others should have as sexual preferences. It's the way we open our hearts and communicate, and begin to live with mutual respect and responsibility; responsibility for our own feelings. You can see how this ties in with the vipassana practice. If you don't have this kind of practice, anger comes up and you explode with the anger. What will keep you grounded? When you are able to watch the feeling of being pushed by another's views or words, how uncomfortable it is, watch anger coming up, then you have a choice. It's at this place that we can literally change the consciousness of the world by opening ourselves to our own deepest wisdom and compassion, and trusting that others do have the capability to meet us there, not just assuming they're stupid and bigoted. Ultimately we will teachnot teach, I want to stay away from the word teach. We will be reminding you in these coming sessions how to do this work within the akashic field. But we start from the mundane realm, just the mundane physical and emotional body. I'm going to bring an exercise in that was scheduled for later. We'll move our whole schedule back 20 minutes so that you can do the exercise now. Some of you have done this with me before. A volunteer? Somebody who's done this pushing exercise with me before. A is going to push me. I'm going to push her back... Push again... I am likely either to collapse and try to get away from her, or to tense up and want to push her back. Either of those things may happen. What's really happening as we slow this down? Touch, being pushed. The first predominant object is the sensation of pushed, pushed, touching. It's an unpleasant sensation. I feel my whole body contracting. The push is no longer predominant. My whole body's contraction around being pushed becomes predominant. The push experience is continued, pushed with one hand, the other hand, in various places, I can start to move with it. Just being pushed. At a certain point there's no tension about it anymore. Now obviously if she had a stick and was hitting me, it would be different. I would then want to move in a different way. We do what we call the Tai Chi “pushing arms” exercise that some of you have done with me. She pushes with her arm. I just let it go past. She pushes as hard as she wants. I don't have to push back; I just let it go past. Eventually we get into a dance together. It's easy. She can keep pushing with anger, with more and more ferocity. It doesn't matter how ferocious she becomes, I just take the energy and let it slip past. I take responsibility for what arises in me, any tension, any dislike, anger, fear, and hold the intention-- go back to your intentions-- hold the intention not to use my fear and anger to harm another. Now each to find a partner. Move your chairs around as you need to in such a way as you can do the exercise, one person pushing against the other. Let one be the pusher in the beginning. Two people facing each other, one pushing the other, forehead, chest, shoulder. I want you to watch how it feels to push and to be pushed. The predominant object is first touch, pushing. There's an unpleasantness to it; nobody wants to be pushed. But life is constantly pushing at you. You're late for a meeting, the traffic jam, the rain coming in through the leak in your roof, the angry phone call. Life is constantly pushing at you. This is about relationship. Barbara told the story, or I told the story, about the man in the meditation retreat, the pounding on the metal, and his teacher said, “Did you note it?” The teacher didn't say, “Oh, that's terrible. Let's fix it.” Just, “Did you note it?” Life is about how we relate to what comes to us, and we cannot always change what comes to us. We change what we can. If you note that you're late to work every day because there's always a traffic jam in such and such a place, you either want to take a different route to work or leave 15 minutes earlier and then you won't have that issue anymore. How do we relate to what comes to us? How do we open our hearts? I want you to feel this directly. Let's call Person A the receiver, Person B the pusher. And then we'll change places. A few minutes in one direction and then we'll change directions, the receiver will begin to push, the pusher will receive. What comes up, and how do you relate? In my description of these workshops, I said that the primary learning beyond all else is self-respect and self-responsibility. This does not mean (said angrily) “I will be responsible for my anger. I won't have anger.” It means noting anger, noting tension. Holding a bigger and bigger space around it until finally you discern the simultaneity of the push and the space. Those of you who have done this with me before, this is where I want you to go. Feel both the contraction and the space. So you have different levels of working with this exercise depending on your experience. If there is contraction, and you feel the simultaneity of that spaciousness, can you rest in that spaciousness without denying the contraction? And then watch, what happens to the contraction, to the tension, to any anger? Where does it go? Does it slowly resolve? If no, what happens to it? Is it transformed in some other way? So let's spend about 10 minutes with this. Are there any questions? Q: Is the goal for us to let the anger roll off, or is our real goal just to notice what happens inside of us? Eventually we take this to the next step. If the person keeps pushing and you're now relaxed, how you learn to say, “No, that's enough.” But that's another step. We're not going into that now. This is just about relaxing and finding the spaciousness so that that “That's enough” can come from the open heart rather than a place of fear and anger. Barbara: People are discussing the response to the pushing exercise. Somebody said, if I don't react in any way, am I validating their angry actions? How do we respond to this? A storythose of you who know me well, please forgive my repetition, but I don't have endless stories! And some stories do illustrate better than others. Back in maybe 1961 in a small southern town, integrating a restaurant. People had been beaten at this restaurant several weeks in a row, coming in to try to integrate the place. So we knew that we could be beaten or even killed. Are you familiar with the word ahimsa? It means soul force, the power of the soul. Not the ego's power, soul power. Not my soul power, the soul power. Coming to this place of connection. Within ahimsa we offer forgiveness. We know that(pushing a volunteer) I'm raising a catalyst here. I'm challenging her. She may punch me. I forgive her ahead of time for punching me because I don't know what she's going to do if I push her. But I know that I have to offer this push. In this case, the push was to go in with three brothers and sisters and integrate this restaurant. I was willing to experience the consequences. I've forgiven the others for whatever action they offer, because they're conditioned and they're acting out of their conditioning. I have to be willing, if I come in there saying, “I'm right,” then it's just push and shove. If I come in there knowing, “I have to do this morally, this is my choice,” but they feel I'm wrong, so I'm giving them a big push, and I don't know how they're going to react. Even if they arm or kill me, I have forgiven them. It's a very deep place to get to. But when we act out of that place of soul force and dynamic compassion (ahimsa), it really changes the results. So it was the four of us, it was a middle-aged black couple and me and a young white man. We came into the restaurant. I could hear then. An angry crowd gathered. The restaurant emptied out. I could hear the people outside screaming. I knew that in past weeks they had had bricks and baseball bats and tomatoes and things like that, too. Of course there was fear. We just sat there. We sat there holding hands for about 45 minutes, not denying the human sense of fear, but opening with such deep compassion to ourselves and to the people out there, and not creating a separation that says, “I'm good, they're bad.” or “My feelings are valid and theirs are invalid.” But just openhearted compassion for all of us. We all must have reached that place of readiness at the same time, because simultaneously we opened our eyes. We looked at each other, we stood up, and we walked to the door. We had sat there. We had not been served, of course, but we had sat there. Nobody had come in and hauled us out. So we had sat there for almost an hour. I felt so much compassion for this crowd, for their outrage, their pain, and I know the three people with me did. We walked out the door; instead of looking away, I met eyes. But I met them not with a challenge, but with my eyes conveying the compassion that I felt. Not pity or contempt; compassion. The crowd just fell back. They simply let us walk out. There was no guarantee that would be the outcome. One person swinging a baseball bat could have started a huge move of violence, and we could all have been killed. But in that moment there was only compassion, and there was forgiveness for whatever might come, knowing that I was instigating this. I was the one pushing. Holding the space for them and for me, for their fear, their pain, my fear and pain. And so we walked out, and we got into the car that was waiting for us and we drove away. I'll never forget the look in people's eyes. Some were very angry. Some were sad. Some were afraid. Some could meet my eyes. A few even smiled at me. Some could not. I didn't ask them to love me; I just walked out. Coming into this place of soul force, this is part of entering into the akashic field. I've never spoken of it in that way before. I'm only recently recognizing how much, in that situation, I was within the akashic field, seeing all the possibilities and holding my heart open to all the possibilities without blame, without trying to fix anything. Just holding it all with this immense heart that we all share. And this changes things. But it has to be genuine. You have to be willing to experience the consequences, even if it means getting slugged with a bat or a brick, or killed. We have to be open to those possibilities because we're setting all of this in motion. Q: Could you repeat the word for the soul force? Barbara: Satyagraha means soul force. Ahimsa means dynamic compassion. Two different words. Ahimsa, dynamic compassion, is not just inactive compassion that says, “Oh, I feel for these people.” but a compassion that's willing to take action, willing to take risk to be involved, but not from an ego. So you have to have done the work first not to react from the ego, and to see where the ego is coming up. And, like the exercise we just did, to pause and go into that space, not the ego. This comes back to the simultaneity of the egoic human and this pure heart. They're both there. We can't deny either one. We're going to cut the discussion short now and move on to the next thing. I hope you all got something out of that experience, learned something from it. Watch this when life is pushing you in any way. I got out of my car going up to my cabin to have lunch and rest, and there was a huge swarm of mosquitoes around me. Push! Push! Well, I have a choice. I can kill them, swat at them, but I can't kill a thousand mosquitoes, or a hundred mosquitoes. Or I can remind myself, okay, I'm coming into their woods. I'm lunch. They're just being mosquitoes. I don't have to hate them. And I also don't have to like being bitten by them. So I grabbed the towel that was in my car and flung it over my head and wrapped it around me and walked to my cabin. There aren't usually that many mosquitoes; the rain has brought them out. Just let them be. They'll go. Aaron: My blessings and love. I am Aaron. Barbara neglected to say that the way you react when being pushed is very deeply grounded in your intentions. It comes full circle. Your intention is not to harm another. Your intention is also not to allow others to harm you. It's bad karma for them to let them harm you. In a sense, if you let somebody knock you around, you're allowing them, and deepening their unwholesome karma. Then how do we stand up to another from a place of truth and love? I remember a beautiful book Barbara read back then in the 60s put out by a Quaker organization, called Speak Truth to Power. It was a booklet, not a long book. My guess is if you Google it, you'll find it still available, and it's a very powerful, clearly written statement. All of this is about exchange of energy. When you are pushed by another, they're pushing their energy at you. When you push back or step aside, you're exchanging energy in various ways. Kindness is energy. Love is energy. Everything is energy. Now, briefly, I want to explore two basic expressions of energy. Tomorrow we're going to go further with energy, working with energy, looking at energy patterns, the conditioning you have with certain energy patterns. For today, we're just demonstrating kyo energy and jitsu energy. You're familiar with the yang/yin symbol. It curves over and curves under; each aspect is part of the other. Kyo is a natural part of your energy. Jitsu is a natural part of your energy. Neither is better than the other. When there is balance is a wide way, there is a balance of kyo and jitsu energy. Sometimes one becomes dominant, sometimes another, but they flow. Think of the ocean rolling into shore, a wave building up, cresting. There is a lot of power in it. Then it slams down. There's a moment when it hits and it stops. Picture the stillness before it begins to ebb back out into the sea and build back into the next wave. Can you picture that? Wave coming in, building up; a huge wave, towering over you, big energy. It runs up on the shore and stops for just a moment. But it must keep flowing, so then it starts to flow back out. It's still kyo for just a moment, quiet, sliding out gently but it begins to pull harder, becoming jitsu. . As it slides out, it forms into the base of the next wave. Jitsu energy coming down again, sliding back out. Can you see that? Let's look at it with the breath. We're going to exaggerate the breath a bit. I want you to breathe in and keep pushing the in breath until it's tight, compacted. You can't take any more in. Can you feel the tension? And then that moment of release, just that first moment as you begin to let the breath out. Can you begin to feel the tension release? Breathing out, easy, no tension. Continue to push the breath out until tension begins to build again. Can you feel that tension? No more breath to push out, but you're still trying. And then that moment of shifting, beginning to bring the breath in again. A moment of stillness, at that shift, flat, and then slowly the energy builds up, breathing in until the lungs are filled to capacity, and there's tension, needing to release. And then that first release. Quiet again, until as you push it out, it builds up into tension again. This is the dynamic movement of kyo and jitsu energy, and it's in everything that you do, ideally in a balanced way. Q: Is that what you mean by the gap (in the breath)? Aaron: No, that aperture in the breath is something different. I'll come back to that. This is something different, the kyo/jitsu pattern of the breath. Jitsu is building up tension, kyo is more flat. In between, we do have the gap between the breath, but let's come back to that. (Invites volunteer up) I want you to hold your hand out. I'm going to put this in your hand. Can you feel the subtle grasping energy? Very subtle. What happens to your hand as it touches? Can you feel the energy relax? (yes) Jitsu, the subtle grasping. And then when it touches, the grasping releases. This is what's happening with the breath. The subtle grasping as the breath comes in so much that the lungs can't hold any more, or goes out so much that there's no more to give out. At the top of the breath, needing to bring in breath. At the bottom, sending out. Bringing it in, needing to release. There is subtle tension, and that experience of kyo energy. But I want to make sure you understand one is not better than the other. They are simply part of an ongoing pattern. I'm going to have you try this. You each have your stones. Find a person next to you. Person A, hold out your hand. Person B, hold the pebble over the hand. Feel that subtle contracted energy. You only need one pebble between you. Then feel the release as the pebble is placed in your hand. Then send it back. The first person feeling the subtle grasping, contraction. Some people live much more in a jitsu pattern, constantly tense, constantly grasping at things, so it's not balanced. Some live much more in a kyo pattern. People with chronic fatigue syndrome, that's a kyo pattern, an unbalanced kyo pattern; people who are hyper may display an unbalanced jitsu pattern. I simply want to bring it to your awareness, to ask you to begin this month watching, is energy balanced in me, and if not, can I simply bring awareness and my intention for balance to this imbalance? Not to fix. If your plant is dry, you add water. If your plant is a bit drowned, you let it dry out, because your intention is to grow a healthy plant. It's very simple. If the plant is drooping because it's over-watered, you don't keep adding more water. If your plant is drooping because it's dry, you don't think, “I'll keep it dry.” You hold the intention to support it by providing balance. Now I want to introduce one more part of this pattern, what we call hyper-kyo, which can be seen in the breath exercise. Picture logs floating down a river. Further down there's a dam. The loggers are sending logs down a steep slope and into the river. They're floating down a few miles and finally arrive right up near the dam. The energy, the water, the logs, are moving smoothly. And then they hit the dam and they crash into each other. Very jitsu energy down there near the dam. But eventually so many logs are gridlocked back there that there's no movement. It looks flat. It looks still. If you take out several logs, they start battering into each other again because there's a little more space. So this stillness is not really kyo, it's what we call “Hyper-kyo”. Hyper-kyo is so compacted that everything is just mashed together and seems still. Is that image clear to you? Okay, now let's take this into the personal experience. A person is pushing, or life is pushing. Tension builds up. You keep saying, “I should be okay with this.” until you get to a place where you believe (in a strong voice), “I'm calm. I surely am calm.” But you're calm because you're so compacted that there's no room for any movement. The energy has stagnated. There's no place for it to go. If we figuratively take one log out, if somebody comes along and puts their hands on your shoulders and just begins to gently massage your shoulders so there's a little space, suddenly you might feel -whoosh! So much anger! But it's been squeezed out by the hyper-kyo experience. This is the place where people most often get lost. They feel, “My energy is balanced,” but they're holding in more and more contracted energy. We have the various body ailments that come from walking around in a chronic state of hyper-kyo. I know a lot of you will see yourselves in that. Maybe not constantly, but how many of you are just walking through life figuratively with clenched fists, clenched jaw, trying to make room for each new catalyst, get it right, and the energy movement just stops because there's no compassion, there's no space? Finding space is not a way of fixing this situation, it's a way of remembering, “Ah, right here in this contracted situation there is space.” Open into that space. I have a wonderful memory of a student who was a dancer. He came to talk to me about working with feelings and emotions. He said, “I can't talk about it. Can I dance it for you?” So he began to move, his whole body moving more and more into contraction. And then vividly, it was like wakening to the state of contraction: “Ah, I have a choice.” (relaxing, breathing) Opening... beginning to let it go. A very powerful movement shown in his dance. Music often has such movements, where the music builds up, crescendo, and then it opens out, and you can feel all the space in it. I want you to begin to bring awareness of this in yourself, holding the intention for the highest good of all beings, and myself to move into a more balanced energy pattern. Now, it's easy to say, not so easy to do. The first and most important step is simply awareness of the habitual ways you hold energy. Another pattern we haven't talked much about is one based in feelings of helplessness, hopelessness, defeat. No energy. Everything is pushing and knocking me around constantly. I can't take another step. Instead of summoning up, not my energy to fight the feeling, invite the energy, opening up energetically and dancing with what's around you. My best image of this, some of you have done this at the Emerald Isle retreat with me. We've had people lie in the shallow water, the waves breaking on the beach. Asked people to roll down the beach and into the water and then just lie there, waves hitting, rolling over them. The water is shallow; they're not going to drown. Feeling the waves roll you this way, roll you that way, back and forth. Feeling the tension when the first wave hits, hardening against the wave, and then realizing you can just relax and be a part of the ocean rolling in, the sand, the whole movement of it, feeling it all moving. One of the vital tools we gave people at this Emerald Isle retreatthis is a weeklong ocean retreat that Barbara and I lead each year with John Orr in North Carolina. We work a lot with the elements - Right there lying on the beach there's the sand, the earth element; there's the water element; there's the sun shining down, the heat; there's a breeze. We invite people to see which elements are in or not in balance in themselves. When you're in a very jitsu state, you might be able to imagine there's not much air energy, there's not much fluidity. Very compacted. Jitsu, hard, hot sun, packed earth. At this point we can start literally to think of bringing in water. What happens if I acknowledge the fluidity in this body, in these emotions? Begin to bring in more spaciousness with air. Open, coming back into balance. As you work with the elements, it also serves to help open the chakras. Barbara has a lot of material about this in the book Cosmic Healing. We had hoped now to be taking you down to the beach and the sand, sitting in the shallow water or with your feet in the water, working with the elements directly, but the weather is not going to permit. So tomorrow, if weather permits, or in August, we'll do some of this by actual experience. But I ask all of you to go home and spend some time. It can simply be on the lawn in your back yard with the sun and maybe a little bowl full of water that you can put your hands in, or a sprinkler that's just barely reaching you and tossing little bits of water on you. Begin to feel what brings the elements into balance, and how does the balance of the elements affect the kyo/jitsu energy patterns and bring it into a balanced state. Again, we are speaking of self-respect and self-responsibility. Respect for this beautiful human being that you are, that has the ability to display its radiance and light in the world; responsibility to do so, because of your intention to serve yourself and all beings with love. Not to hold unwholesome patterns, be they body or emotion; and of course they go together. We're going to refine these tools in depth as the weeks go by, but I want you to go home and practice this, because talking about it will not do it. You need to actually do it. You can simply sit on the grass outdoors with your hands in a little bowl of water, splashing, sun beating down. Just feel the different elements. Begin to go into your body and feel the climate inside your body. What is the energy like when the elements are balanced? When something comes up that brings angeryou've been sitting out there, you're relaxed, and here's a letter in the mail that says your house assessment has been raised $50,000 and your taxes are going way upanger. What happens in the body then? What habitual patterns do you have in your body for holding anger, pain, desire, that lock the body into imbalance? What helps to bring back balance? To take this question one important step further, if you continue to hold onto imbalance, what are you getting out of it? It's not comfortable. There must be some old belief system that this armoring, this tension and compaction helps in some way, or this complete letting go. When I say letting go, I don't mean that in a positive way, but simply, moving into a huge state of kyo, energy-lessness (collapsing sound effect). What do you get out of it? In this moment, if I take responsibility for my energy field, what am I afraid will happen? In what ways can I more deeply open? 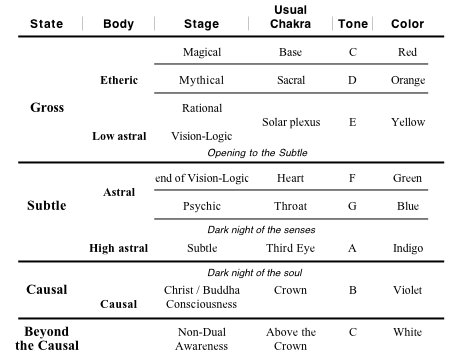 The elements and the chakras go together, as we show on the chart of states and stages of consciousness. When there's a lot of anger, which chakras are closed? What happens if you bring loving attention to those chakras? For example, if the belly is closed, just put your hands over it, noting armoring in the belly; closed. Begin to bring attention to the elements right there in the belly, in that hardness. What elements are lacking? What happens if you breathe air into the belly? What happens if you visualize the flow of water, or even better, go stand under the sprinkler? Run through, or lie down in shallow water? How does that affect the energy in the belly, and the chakras' openness or closedness? Up at the heart, what armors the heart? There's no one answer. Everything is grounded in intention. If I have the intention beyond everything else to stay armored and protect myself, then I'll stay closed. If I have the intention to take the risk, to open myself just a little, then I can begin to explore with the elements and the chakras, to understand what habitual tendencies I have that cut me off from this movement of energy. This is the part of the vipassana practice, seeing deeply into the habitual patterns of ways we hold energy in the body, and emotions. You are deeply conditioned to this armoring as humans. It's very powerful, such old conditioning. There's a line I love in the poem The Wasteland by T. S. Eliot. I'm not sure if I can recite it accurately, but close. Which an age of prudence can never retract. By this and only this, we have existed. Are you ready for that moment's surrender? How long are you going to live your life in a contracted state? As we move into a stable higher consciousness, we become increasingly uncontracted. I don't mean completely uncontracted. There's still that balanced kyo/jitsu energy, but it's a balanced contraction, not walking along armored, and not walking along falling into a thousand little pieces. Intact, whole, energy flowing through, this is a hallmark of a higher stage of consciousness. The vital thing here is that this is not something you attain. This is your birthright. This is who and what you are from the start. Now it's time to pay attention, because you have the intention to bring forth and open this loving heart, and connect to the world, to serve from this place of emptiness of an ego, to act skillfully and lovingly in the world. So, we continue. We were going to do some exercises outdoors and on the beach, but it's not the afternoon for it. So we'll be a bit flexible, looking with Barbara at what we might do here to help you better integrate what we've been teaching. There's an exercise that I'm going to have you try. It's going to involve pushing all the chairs to the side of the room after I finish the introduction. What I would like you to do is to form into your same groups, more or less, groups of about 10 people. I want each group to form in a small circle facing each other and take various hands, not just 1, 2, 3, around but across and around until you are quite scrambled, some of you facing in, some facing out. And then I want you, without letting go of hands, to unscramble yourselves. Come, please... (demonstrating) When I say without letting go of hands, you don't have harden the grip. The hands can swivel, so we keep in touch with hands, but no broken wrists. So there's a bit of looseness to this. I want you to do this in silence. The whole group needs to think as one organism. Each of you needs to take responsibility for your own energy-- the person who says, “Oh, we can't do it,” in their heart. The person who wants to lead everybody and tell them how to do it. The person who thinks of it as something to fix, or is looking at the other groups to try to compete and do it first. Just relax. Keep watching your energy. Pause as is needed. I said no talking, but in any group, anybody can say “Pause” if you need the group to pause. If you feel the whole group energy is getting too hyper, “Pause” is an invitation to come back and re-center. The whole group, you are one organism untwisting yourself, not separate parts. This is really an akashic field exercise, but I'm not talking specifically about the akashic field at this point. We'll talk more about that tonight. What I want you to do is simply to feel the flow of energy within the group and your own energy, any strong areas of contraction. What helps to release that contraction? Remember the non-duality. Right there with the contraction is that which is not contracted. Okay, let's start with a short guided akashic field meditation. I'm not going to try to define the akashic field, just to take you into the akashic field through a guided meditation, and then we'll have about 20 minutes of silent sitting. Then we'll see what questions there are, and disperse until tomorrow. Please join me. We are all fish in a lovely clear sea, whatever kind of fish you wish to be, big, small, bright, dark. We're in a lagoon where the water is gentle, swimming through fronds of seaweed, very lovely. Moving with the current. Below us, the water grows darker as we move away from the light and sky. Above, there is increasing light, the colors brighter. Just swimming at ease in this beautiful space, truly a heaven realm for fish. No large predators, although some fish are larger than you. There are many small, almost microscopic creatures, good for eating. The cover of the seaweed, tall fronds of seaweed. Enjoying the color, the light, the ease of motion through this space. At times you come up almost to the surface, or break the surface, to catch an insect. Seeing the sky above you, not naming it as sky, just a different texture than your water, and very bright. At times you drop down to the bottom where the floor is hard, sand and rock, much darker. But nowhere does it feel threatening. Feel yourself moving at ease through this space. Feel the pleasantness of it, and how uncontracted your energy field is. And now we are swimming out of this safe, small lagoon through an opening in the coral, out into the much deeper and rougher open sea. As you swim through the aperture out into the ocean, feel the suddenness of the current grabbing at your body, a swift current pulling you away from your home lagoon. Overhead, waves breaking, the water churning around you. What drew you here? Partly curiosity, partly just swimming, not paying too much attention. There was an open space, so you swam through. The water is colder, and much deeper. Feel the turbulence outside of you and inside, swept this way and that by the current and the waves. And suddenly, terror! A huge shark is upon you, chasing you, chasing this whole school of fish that we are. Swimming as fast as you can... Feeling the heart beating, terror. ...And he is gone. We have lost our bearings, hard to remember which way our lagoon is, our safe, calm water. Feel the tension, wanting to go home. Wanting that safety and quietness. Where am I? That which is aware of feeling lost is not lost. From the small self there is still terror, tension, and exhaustion from fighting these currents. Another level of your being, this pure awareness mind, knows which way to go, knows where that gap in the coral wall is. Allow yourself to tune deeply into your intention, for you and your whole school of brothers and sisters, to come safely back into that space. Try not to move from fear or agitation, but breathe into the still heart. Allow yourself to enter that space of stillness and of knowing. In one direction the water is rougher; in another, it's a little bit quieter. In one direction the waves seem to crash ever larger, and another, the water is a bit shallower. “I choose peace. I choose stillness. I choose safety.” Allow yourself to be drawn along by your intention. Know your capability to choose wisely and with love. Coming back into our safe lagoon. Ahhh, home. Let us just swim around here for a few minutes, at ease, feeling safe. Such a soft current here in the lagoon, warmer water, beautiful colors. And yet again, as time passes, some intention comes up to move back over the edge of the reef and into that deeper water. Remind yourself very gently: there will be stronger current. The water temperature will drop. There may be pounding waves, depths with darkness, predators. Can I enter into that territory with kindness? Not with fear, and not just moved by idle curiosity, but with a willingness to explore the fullness of being. Moving out into that wilder water, and then in time coming back to the safety of the lagoon. And again, and again. Not held in by old limiting beliefs, and not reaching out from a place of grasping. Just opening to the fullness of my being. Each of you has derived certain spaces that are safe, home spaces to you, often bound up in limiting beliefs. And each of you has swum out into the turmoil of the greater world. If you force yourself out, it doesn't work. But when we swim out and find the spaciousness of the world out there, there is joy. In swimming beyond our lagoon, we grow. Looking at ourselves we realize suddenly we are the big fish. We're both; small prey to the big predator, big predator to the smaller fish. But we do not need to be prey or predators; that's a matter of choice, too. I want you to feel how the heart can choose where it is most appropriate to swim in each moment, to feel at ease in that choice. When there is no intention to harm or to be harmed, it becomes safe to move out beyond the prior limits. And it does not feel like a prison to come back into the safe lagoon, because one is always able to swim back out again. I just want you to feel the joy and ease of that, making this choice of where you swim from the open heart, with no contraction or sense of fear, no grasping, no “I should.” Choose what delights you and will delight others, what serves you and will serve others. We're going to sit quietly for awhile. I want you to explore the metaphor of this lagoon. In what ways do you hold yourself in a small space to be safe? In what ways do you force yourself out, saying, “I should move out. I should do more.”? Feel within the open heart the ease with which you can move back and forth. I've not led this meditation before. I thought it would be an akashic field meditation, and it's not. It's more an intention meditation. But we'll leave it just as it is. Use your vipassana practice as feels suitable. Just be here swimming. Watch what arises and how you relate to it. Discover where ease, joy, and spaciousness lie. I'll be quiet now for about 10 minutes. I am telepathic. I will not invade your privacy, just take what you are sending out, and a few of you are enjoying images of being dolphins leaping and playing out in that open sea. Enjoy! The akashic field comes into it because it is from that ground that you co-create. And some of you are literally co-creating this play with each other, not consciously, but truly doing it. Unless you co-create the big predator, why should there be a big predator? Unless you co-create violent surf that would smash you on rocks, why should it be there? What is it you truly seek? Yes, some of this is imagination, and also at some level you are moving into the akashic field of infinite possibilities and seeing how lovingkindness can choose the most wholesome of those possibilities, and with joy. There is a beautiful Buddhist sutra in which the Buddha states, “You are what you think. With your minds, you make the world.” He goes on to explain that if we create in our minds a horrific scene, we help to draw that to us, to create it. We act in such ways as if it already exists. If we choose a much more peaceful setting, we act in ways that that already exists. If you move into an encounter with a stranger and you anticipate that this person is going to be hostile, you give off your own subtle hostility that invites their hostility. If you trust that this meeting between you and the stranger is going to be cordial and respectful and openhearted, you invite that. What are you inviting in your life? Does it fit with your highest intentions? We have the practice that we emailed out, clear comprehension. Clear comprehension of purpose. What is my highest purpose? Clear comprehension of suitability. Is what I am about to say or do suitable to my purpose? Taking it into meditation and seeing the many possibilities in each moment, and how energetically we are drawing something to us or pushing it away. Clear comprehension of the dharma. Truly understanding that everything arises out of conditions, and when conditions cease, that object ceases. Your rain today did not come to get you in some way, to spoil your lovely day at the lake. It came because certain atmospheric conditions were present. When they change, the rain will go. Sometimes we have a choice; sometimes we don't have a choice. We cannot control the weather; we can only watch how we react to the weather, and to the inner atmosphere. What we draw to us that brings forth tension and agitation and pain, or that peaceful lagoon filled with love, and the greater sea without the horrific monsters. We do this increasingly consciously, working from the akashic field. If you would, try to visualize this with me. Pulling ourselves out of the ocean environment now. A vast open field, dry, just dry earth, a gray sky. Everything more or less neutral. Hold the intention for a beautiful garden here. What conditions are needed? Seeds. Draw into you the seeds that you wish to plant, envisioning the different colors and textures of flowers and fruit and vegetables, and drop those seeds into the still-barren earth. What is needed? The seeds are in the ground. We need sunshine; we need water. Hold the intention to draw them forth in balanced measure, nourishing the earth with water and sun, moisture and warmth. Feel the seeds growing. See the sprouts, and eventually the beautiful colors. Taste the fruit. But the negative thoughts may still arise. What do we do then when the thought “I'm not worthy of this beauty and grace” comes up? Aha, you look at it, aware of “thinking, thinking.” “I'm not worthy of it.” “Is that so?” It's just a thought, “I'm not worthy.” Am I going to let my energy move with this to create further conditions to destroy what I wish to create? Or am I going to be present with this thought, “I'm not worthy,” and ask, “Is that so?” and see how it's also growing out of old conditioning, is impermanent, is not self? Ask yourself at that point, what is it that I am choosing? Do I choose love, grace, plentitude, friendship, connection in my life, or do I choose isolation, emptiness and loss, out of old limiting beliefs? Aaron: I'm asking if they could feel the spaciousness. You always have the choice, but sometimes you are so deeply conditioned that you forget you have the choice. At the next workshop we're going to practice with some of the exercises in non-violent resistance that Barbara learned many years ago. How to work with others who are agitated and find the place of clarity and love in the self, and invite that from others rather than getting caught up in their agitation, and how we do that. And specifically, how we enter into the akashic field to do that. So there's one level of doing it from the ego, which can lead to some wholesome results but also some mixed results, and another level of doing it from this place of pure awareness, which watches the ego as an object without getting caught up in its stories. I'm not going to go into that tonight. We may do some of that tomorrow. But I want those of you who are newer to meditation to have a chance to settle deeper into the practice, practicing at home this month so you're ready to come back and go deeper from a deep experiential place, not just from the brain. Moving on, then, to questions. Q: If there aren't any questions, I'd like to hear a story about one of your lifetimes where you used akashic field work. Q: I wondered if you could say something about the relationship between dzogchen and the akashic field. Aaron: We introduced this a bit at the beginning of the day today. Dzogchen is a practice from the Tibetan tradition. It has two levels, trekchod and togyal. The trekchod is the practice many of you have done with me at the June retreats. We have not labeled it as trekchod, just “Pure Awareness Meditation,” sitting eyes open, resting in awareness, feeling the spaciousness and luminosity, a sense of joy. Perhaps as you sit thusly, suddenly there's a bee buzzing around you head. Contracting comes. So Awareness observes the object and sees how it is just one more expression of the unconditioned. Trekchod means, in a sense, cutting through. We cut through the idea that there's something separate or “other than” out there. We ask the question, “What is it?” “Is there anything other than? Anything here that's not an expression of the Unconditioned?” It may not be a pleasant expression, but I don't have to separate from it. We just keep reminding ourselves of the possibility of non-separation, and as soon as the contraction and fixation on that as a separate object dissolves, there's spaciousness again and the pure awareness mind reopens. When this practice becomes stable-- and some of you have done it as a formal practice, some of you have simply done it intuitively in your lives, never having met it as a formal practice. - This is something else we can do here. How many of you have never been introduced to this in a formal way? Okay, perhaps another Saturday workshop! Or a lovely way to watch the sunset from that “Ahhh...,” spacious awareness. The togyal practices are much more restricted Tibetan practices, restricted because they acknowledge the true power you have when you come into this space of pure awareness and co-create from this, what the Tibetan tradition in the English translation calls All-Ground. or a variation of the All-Ground called primordial purity. There are a lot of visualizations, of gods and goddesses and flowery beings and so forth. For me who come from more simple traditions,, they don't really feel necessary, nor do they fit with the simplicity and clarity of the vipassana practice. So I simply prefer to use the term akashic field, which is basically the same thing as the All-Ground. It's the place where mind rests before anything has arisen. In the meditation I asked you to visualize that barren plane, nothing growing, dark cloudy sky but no water, dry earth, no sun. What happens as you add the sun and the moisture and the seeds? What seeds are you going to grow? Vicious thistles? Thick thorns? Sweet apples? What do you choose to grow? I'm not opposed to you growing the thorns. Look at the rose; it has the flower and the thorns. What is it you choose to create, or more emphatically, to co-create, as a community, as a society, as a country, as a world? When we look at the handful of potential seeds, which ones are you going to put into the ground? Can you see that if you plant this one, it will bear this fruit? That one will bear a different fruit. What is it you wish to co-create? If another country across the world is being violent, threatening, are you going to meet that violence with violence? That's one seed. Are you going to meet it with a passivity or helplessness? “Just steamroll over me.” That's a different seed. Are you going to meet it from a place of deep compassion that truly sees that country's pain and fear and the level of consciousness they're at, and responds appropriately, as you do to the three year old? She's having a temper tantrum. She's hitting you. “No, you may not hit me.” You don't throw her out the window. You hold her in your arms. But you prevent her from hitting you until she calms down. When we go into the akashic field, the value is that from that ground - because you are resting in pure awareness, it's not you, not the ego, not the everyday mind, but this pure awareness - Awareness Mind can see the possibilities and the fruits of those possibilities. One simple example. There's a plant that grows by the shore of the lake, purple loosestrife. It was imported from somewhere. Somebody thought it was beautiful. It's not just here on this lake; it's everywhere. It's what they call an invasive species. It's taking over all the native species because it's strong and becomes dominant. So, on the one hand, somebody brought it in thinking, “Oh, it's beautiful. Let's plant this.” But they did it from the ego that said, “I want this pretty purple flower here,” rather than from the akashic field and the clarity that sees, “What are the wholesome aspects and the unwholesome? If I plant this, what are the results going to be?” If I plant kindness, what are the results going to be? If I plant hostility, what are the results going to be? If I wish to plant kindness but I'm feeling angry, what do I do with that anger? I cannot deny it. I cannot act it out. That which is aware of anger is not angry. I open my heart to the human experience of anger and I rest in that spaciousness that is not angry, with no denial of the anger. I do this from within the akashic field. From this space, I am able to respond appropriately, with compassion; able to say no appropriately, when needed; able to see the long-range results of what I'm offering out. Now, I can't control all of those results, because there are many other factors besides me. But on the whole, my experience of many lifetimes has been that if what we offer out is based in the loving heart and the intention to non-harm and is wholesome, it bears sweet results, maybe not short-term, but long-term. If what I offer out is based on the contracted heartfear, the ego wanting only for itself-- it bears unwholesome fruits. So this is a long answer to your question. Basically there's no difference, we're simply putting it into an accessible American format. Barbara worked her way through a very beautiful text called Circle of the Sun, a restricted Tibetan text. You may have received parts of that in your course pack. It was optional reading, offering some of her work with it. There were a lot of Tibetan words in the original text. It took a lot of explanation. She was working with it with her Venture Fourth student group, and I said let's simplify it. This is what led us, several years ago, to try to find a way to share these teachings in a much more accessible way. Some of you have no dzogchen experience and we were happy to provide some, because the basic trekchod practice is extremely helpful. However, most of you have experienced resting in Awareness, even without formal practice. Is there anybody here who in adult life or as a child has never lain on a hillside and just watched the clouds go by? Just resting in awareness. That's it. It's not everyday consciousness; it's different. When you rest in that way, there may be some imagination, “Oh, that cloud looks like a castle. This one looks like a flower.” But there's no story of “That castle, is somebody up there going to shoot at me?” The mind doesn't go into these kinds of stories. There's just an open spaciousness, ahhh, resting in that spaciousness. This is “The View” of trekchod. Then the meditation stabilizes the View, until you are able to carry it into the world as the “Action” phase. If we had ten weekends together, I would ask people to be stable in this practice before we begin. To be inclusive seemed more important, and to trust that your life experiences will fill in the gaps and we will practice as we move forward.. So we cultivate that pure awareness mind. We cultivate the vipassana mindfulness, noting what arises and how we react to what arises. Noting the mind and the body. We find the spaciousness wherein we can respond appropriately. If the ego does this, and says, “No, I'm going to be good and respond appropriately,” it's not going to work. How many politicians do you know who've said, “I'm going to be good. I'm going to get it all right.”? And they have so many opposing views. And they're all acting from good intentions, but also from their egos. So this practice is to help you drop below the ego level. This is why we did that human knot. Could you feel how, when you relaxed into the group consciousness, you could unwind? But if the ego said, “Oh, I know what to do,” it just made the group more stuck. Could you feel that? (yes) So this is what we're learning about. Okay, a story. A campfire story as planned but without the campfire. Give me a moment to think about it. This is one I've told before, but I think it illustrates the akashic field well. I lived in a rural village where the land was hilly; there were plateaus with farmland and trees on the steep slopes going up the mountainside. We had one community well, a deep and clear well. People lived a peaceful life there. Life was good; food and friendships were plentiful. I had a wife and children who I adored, as did most of my brothers, figurative brothers, people of my community who I loved. Then came a terrible storm, rain driving down for several days; a mudslide washed the trees and the earth down the steep hillside into our village, inundating us. Many people were buried in that mud. It was still raining hard at first; we couldn't do anything, though we did try. The land was too soft to dig. . After a day or two, the rain stopped, the sun came out and the earth stabilized a bit. Our farms were gone, our homes were gone, our families were gone. Those of us who had been up on the hillside on terraced farmland had literally watched this mud crash down one piece of the slope and cover parts of the village. We dug out many bodies through the following days. There was despair. We were an isolated village. We were very close, and there were many extended families there, so people lost spouses, children, parents, sisters and brothers, nieces and nephews, and friends. We didn't want to go elsewhere. Where would we go? But how could we live in this space? Our well was buried in mud. We could see where the well had been just by knowing the lay of the land, but there was thick mud over and within it. The ego said, “Get out of here. Go.” And some people did leave, although it seemed almost certain they would perish on a journey because there was no place to go. But there was panic; people cannot live long without water. In deep meditation, I saw the many possibilities. I knew that the sweet water of that well, the fresh underground spring, was still there, it was just buried in mud. If we dug deep enough, we would come to it. The logical mind told me, “Just get everybody out. Go.” Some people were still busy literally digging up corpses to take off to bury. But a few of us settled down digging where the well was, digging down and down and down. All I could see on the conscious level was mud, but from within the akashic field was the clarity, the deep spring is still there. It cannot be lost. So we dug. As our hole into the well grew deeper, we lowered buckets to one man down in this hole. The buckets were filled and the mud pulled up, endless mud!. We dug and we dug for several days, until finally we were able to clear all of the mud out of the well down to the freshwater spring, which of course was still there. With sweet water there was hope. We could not save our loved ones, but in truth it was only less than 10% of the community who perished, those living in that one area of low-lying houses where the greatest of the mud had fallen, and who were at home in those houses. We would grieve, but our farms still existed above. We could build new homes. The one thing that we absolutely needed was fresh water, and here it was. The ego could not have found it. Only by going into the akashic field and knowing the existence of this deep spring, holding the intention to reveal it, could we do so. Yes, there's a metaphorical aspect to this story, too, although it's an accurate literal story. How often have you despaired of the deep spring in yourselves, only seen the chaos, the outer voices of turbulence? This is why Barbara and I named our center “Deep Spring Center,” to remind us of the existence of this deep spring and that it is accessible. But the conscious mind often cannot find that deep spring. We have to go into the deeper place of the heart. If we had simply said, “We're going to keep digging,” yes, willpower might have uncovered it. “We'll do it. We'll do it.” But we probably would have had to dig in 20 different places. By going into the akashic field, we were all able to come together and say, “This is where it is.” Imagine this huge field of mud. How do you know where to dig? It's here. We held hands in a circle around the area. We asked, just as you did in unraveling yourselves, “Where is our spring?” We went into the akashic field, finding a clarity that knew “it's right here”. We were all agreed. We just started digging. There was no dissention that said, “No, I think it's over there.” So we knew we were on track, and we dug until we came to it. Are you willing to dig until you reveal that deep spring in yourselves, that sweet water of lovingkindness, and bring it forth, to quench the thirst of all who suffer? That is my story. One more I'll ask if there are any questions. Shall we end here then and send you off to bed, or to your evening? We will see you again in the morning. Just because we're scheduled until 9pm doesn't mean we need to go until 9pm. We would have been sitting around a campfire, so instead we'll simply go home. Thank you for being present with me today. My deepest love to all of you. May the work that we do here serve for the benefit of all beings everywhere. Through our own inner work and dedication, may we alleviate suffering everywhere in the world, with love, so that all beings may be happy and find peace. Whatever good may have come from our gathering today, we dedicate it out to all beings. Thank you.